What Is Google Home? And What Are Max and Mini? Google Home Smart Speaker Line. Google Home is a series of smart speakers you place around your home. They can play music, answer questions, and, with the right additional hardware, control parts of your home. They work by using a combination of artificial intelligence (AI), software, and hardware. The speakers come in three sizes, but you only have to buy one to get started. Built-in Voice Control using Google Assistant. All units have built-in microphones and speakers. Built-in Dual-band Wi-Fi is provided for internet/network connectivity. However, there is no wired Ethernet network/internet connection option provided. Google Home Smart Speakers come with an AC power adapter and detachable cord — they do not run on battery power. The original speaker, Google Home, comes in white, but the speaker grill is detachable with several optional colors. The Google Home unit measures 5.62-inches (Height) x 3.79-inches (Diameter) and weighs 1.05lbs. In addition to voice control, there is an onboard control for volume up/down, which can be accessed by touching and rotating your finger on the top surface of the unit. If you want to turn the mics off, there is a push-in microphone on/off button on the rear side of the unit. There are two microphones located around the top edge of the unit provided for voice recognition. The microphones are always on (unless purposely turned-off), even when music is playing. This means that can give voice commands while listening to music. Dual 2-inch stereo speakers and dual 2-inch passive radiators are provided for music playback, Google Assistant voice responses, and audio support for phone calls. There are no provisions for physically connecting additional speakers, but the Google Home can stream music to other Chromecast devices. The Google Home Mini looks like a small flying saucer with a fabric top. It comes in white, but the fabric top is detachable with optional color schemes. The Google Home Mini measures 1.65-inches (Height) x 3.86-inches (Diameter) and only weighs about 6 ounces. Onboard control for volume can be accessed by tapping the left side (volume down) or the right side (volume up) of the unit. If you want to turn the mics off. There are microphones under the fabric over. They can be turned off using a switch located on the right front of the base. The Google Mini has single 1.6-inch diameter speaker housed beneath its fabric cover which projects sound up and out in a 360-degree pattern. The Google Mini can't connect to an external speaker but can stream music to other Chromecast-enabled devices. The Max is the largest Google Home smart speaker, and provides all of the functionality of both the Google Home and Google Home Mini units but is designed for those that also desire a high-quality music listening experience. 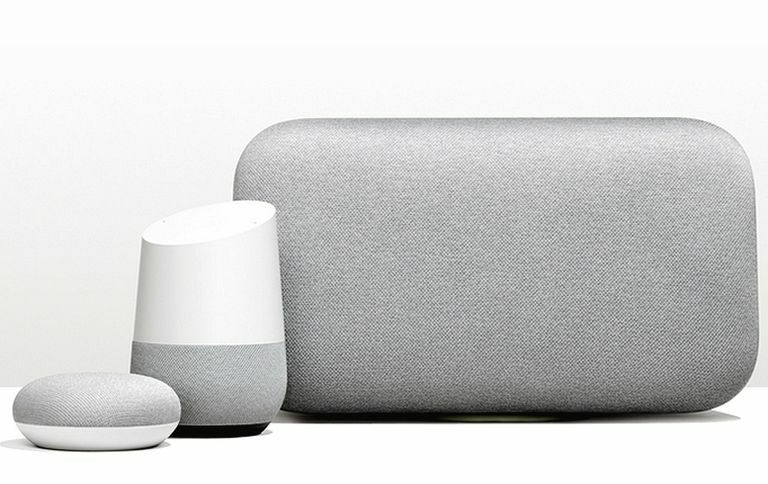 The Google Home Max comes in white, but the speaker grill is available either Chalk and Charcol. The Max is substantially larger than the Google Home and Mini units, measuring 7.4-inches (Height) x 13.2-inches (Width) and 6-inches (Depth). The Max weighs 11.7 lbs. Onboard volume level can be controlled by tapping either the left side (volume down) or right side (volume up) of the unit. Built-in microphones are included for wide far-field voice detection even when across the room or when music is playing. There is a mic off switch. There are two 4.5-inch woofers and two .7 diameter tweeters provided for stereo music playback, Google Assistant voice response, and phone calls. The Google Home Max incorporates Smart Speaker technology, allowing the Max to correct for room acoustics dynamically. Wherever you place or move the Max, using its microphones and Smart Speaker technology it will optimize to produce the best possible music listening experience, including playing at lower volumes at night and equalizing the sound for the type of content, such as music, news, and podcasts. In addition to accessing music via online streaming, the Google Home Max allows connection of external sources via its built-in 3.5mm analog audio input connection. Issue up to three commands within a single request: Ask about the weather, check your calendar and turn on the bathroom light within a single, "Okay, Google" request. Use Multiple Actions: You can ask multiple questions in a natural way. For example, instead of asking, "Okay, Google, what's the weather in Denver and what's the weather in New York City?" you can say "Okay, Google, what's the weather in Denver and New York City?" Listen To Music: Once you have your speakers set up, Google Home devices can stream music directly from Google Play Music, Spotify, Pandora, and more. Another music playback option is via Bluetooth. Make Phone Calls: You can make hands-free phone calls to persons and businesses throughout the U.S. and Canada (both English and French). You can call by name or phone number. However, if you ask Google Home to dial a number, the receiving phone will think that the Google Home is a private number. Get Information: Ask a Google Home device any question you want (weather, sports scores, movie times, traffic, spelling, word definitions) and an answer will be spoken. If Google Assistant does not know the answer, it will tell you that also. Also, Google Assistant works with Google Translate. In addition, Voice Match allows Google Home to recognize up to six users. Shopping and Service Ordering: You can use Google Home devices for shopping, ordering take-out and delivery, making restaurant or flight reservations, buying movie tickets, get an Uber ride, and other tasks. Google Broadcast: Whether you have one or more Google Home devices in your house, you tell Google Assistant to have all those devices play a specific message or announcement. For example, "Hey Google, Broadcast this message: It is Dinner Time." Family Link: If you setup a Google Account for your child(ren), they can use Google Home Devices, with music, information, games, and other activities specifically tailored for them. Examples include playing games, such as "Space Trivia" or reading a bedtime story. Control Google Chromecast: You can use the Google Home to control any Google Chromecast-enabled device. Tell your Google Chromecast to play videos from streaming sources on your TV, or, if you have a TV with Chromecast built-in, you can use Google Home to play streaming content that the Chromecast media streamer or TV has access to. You can also pause, or turn the volume up or down your TV. Using the Google Home to power your TV on or turn it off is a feature that is expected to be added via a future update. Control Your Home: You can use a Google Home device as your home assistant. It can integrate with several third-party control systems. Companies such as Logitech, Nest, Philips Hue, Tp-Link, Wemo, Samsung SmartThings, make products that allow Google Home to control lighting, thermostats, smart plugs, switches, and some home theater devices. These options require additional equipment and pairing. Google Home Smart Speakers incorporate practical features for a variety of entertainment and lifestyle tasks. Combined with Google Voice assistant technology, they offer the ability to listen to music, access useful information, make phone calls, and perform many personal and household tasks. All you need to get any Google Home unit up and running is a smartphone or tablet with the Google Home App installed.